A light coloured medium viscosity neat cutting oil, designed for general purpose light duty machining operations. A product developed specifically for metal cutting applications where the lubricant is applied by air-misting. A high performance neat cutting oil specifically developed for use on severe applications. It is suited to general machining operations on ferrous metals up to medium tensile steels and non-ferrous metals. The additive system ensures improved surface finish and tool life whilst remaining non-staining to copper and its alloys. Careful selection of base oils and additives ensure the product is pale in colour, low in odour and low viscosity in use. 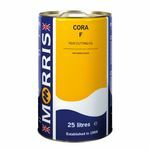 CORA G is a low viscosity, extreme pressure neat oil specifically developed for use with copper and its alloys on automatic machines. The low viscosity ensures excellent swarf flushing which can prove to be problematic with other fluids. Despite the low viscosity, CORA G remains low misting in use. It is of pale colour and low odour yet ensures improved surface finish and reduced tool wear. A neat cutting oil with high levels of active sulphurised fat and chlorine EP additives, making it suitable for a variety of medium to heavy duty machining operations on ferrous metals. Particularly suited to thread rolling and gear cutting on medium to high tensile steels. 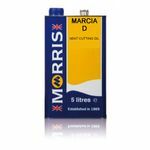 Specially selected base oils and additives ensure a low misting potential in use, whilst also ensuring excellent flushing of honing stones and excellent swarf separation. Marcia H may also be utilised in a number of light to medium duty applications involving free cutting ferrous alloys.